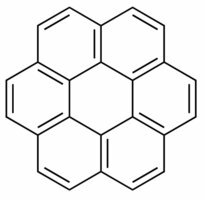 Coronene (also known as superbenzene) is a carbon and hydrogen molecule that is made from six peri-fused benzene rings. Its chemical formula is C24H12. 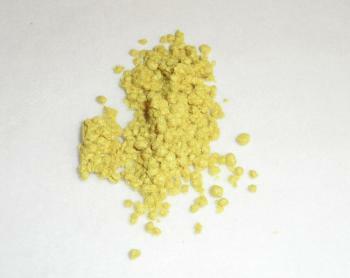 Coronene is yellow in color and it dissolves in solvents such as benzene, toluene, and dichloromethane. Its solutions emit blue light fluorescence under UV light. Coronene is not used for many applications, but it has been used as a solvent probe, similar to pyrene. Coronene can be used to synthesize graphene. In 2016 researchers from Shanghai reported that coronene greatly improved the homogeneity of monolayer graphene when used as nucleation seeds for graphene synthesis using a low temperature CVD process. Coronene was also studied as an alternative material for graphene in transistors. In 2010 researchers from Germany, China and the US developed transistors made from Coronene which showed an improved band gap compared to similar graphene based transistors. Coronene is now offered in high quality (97% purity) and relatively low cost online at The Graphene Supermarket. As this material may prove to be an interesting path towards low-cost high-quality graphene synthesis, it will be interesting to see if researchers and/or commercial companies adopt Coronene in their process.